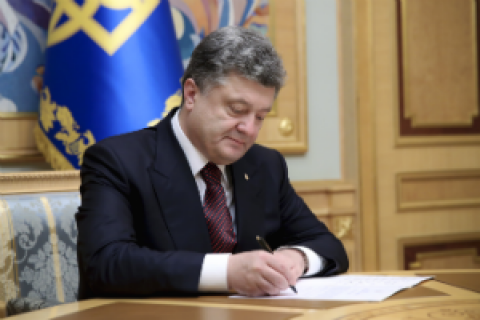 President Petro Poroshenko has signed the bill into law setting a 75-per-cent quota on TV programming in Ukrainian. "Thanks to media representatives for their proposal to introduce the quotas and bring the Ukrainian language back to Ukrainian media. I have signed the law to this effect," he tweeted. He added that this decision protects Ukrainian among other languages. "No-one minds other languages on TV screen but it is inadmissible for the Ukrainian language to account for 15, 20 or 25 per cent on any Ukrainian channel. Thank God, we've managed to protect it," he said. On 23 May, parliament passed the bill obliging TV channels to have 75 per cent of their programmes in Ukrainian, or face a penalty reaching 5 per cent of their license fee.